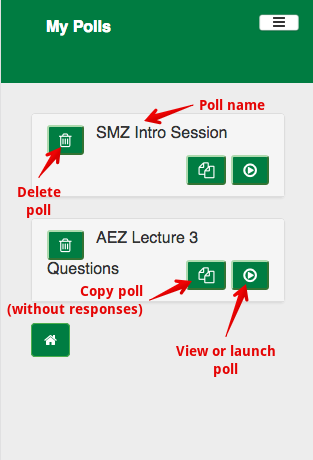 In ePoll, the quick polling method allows instructors to quickly and easily poll students using question and answer prompts displayed in lecture slides. Instructors also have the option of constructing complete question lists in advance for use during lecture. These lists are best created using a desktop or laptop computer and then launched from a mobile phone during lecture. 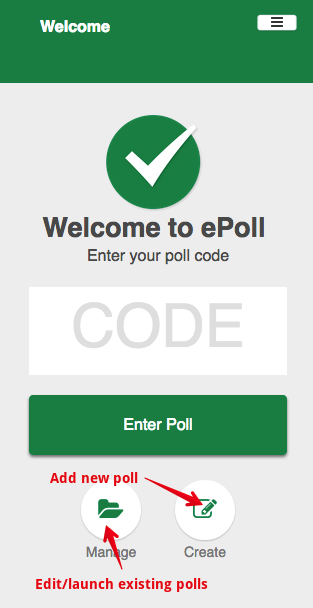 Access the system at https://epoll.srv.ualberta.ca, log in, and click Create. Click Manage to access existing polls, continue editing them, and to launch polling. Re-name the poll by clicking the default name (timestamp) and entering new text. Click anywhere outside the title to save. To add a question, click on the Add question button. Multiple choice - allows participants to select from listed answers. True/False - allows participants to respond either True or False. Blank answer - allows participants to enter text answers with the responses displayed as a simple list. The question title can be edited by clicking and entering text over Question text. The answer prompts can be edited by clicking and typing text over A, B, etc. The number of answer prompts can be adjusted by clicking Plus or Minus. Answers can be designated correct only after Gradeable is toggled for the question. For more information on correct answers and grading polls, see Scoring Student Responses. Toggling Live Results affects the instructor view only. 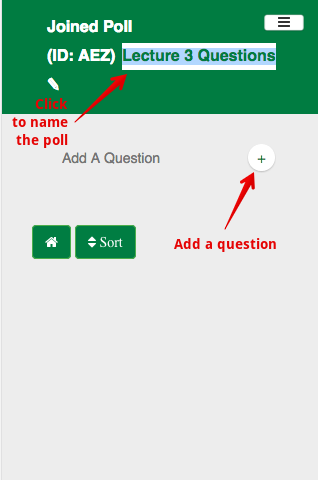 To add another question click the Save button to return to the question list. Note: Clicking the Exit button without clicking Save will discard any changes. On the Question list screen, the icon shows the question type. Launch polling of a question by clicking the Go icon. Questions can be Duplicated and Deleted. Questions can be re-ordered by clicking Sort and then dragging them into the desired order. Existing question prompts and settings can only be changed if the question has not been launched for voting (whether votes have been recorded or not). Once answers have been saved for a question, the question list screen allows instructors to view those results and/or broadcast them to students. The action menu at top right allows session data to be Exported to the eClass gradebook or Downloaded as a .csv spreadsheet. Questions can be duplicated to re-launch the same poll. The Home button shows the Manage polls screen. The My Polls screen enables access to and the option to launch existing polls. It is also possible to review old polling session data. Sessions are identified by their code and timestamp (or any custom name entered). Polls are launched by the Go icon to the right of the name. The Delete icon at the left of the poll name will remove a poll (and all the data it contains). Entire polls and all questions can be copied by clicking Duplicate. No student response data is included in duplicated polls.